COMPASS Wealth Management, LLC is focused on your needs and our recommendations are tailored to address your specific financial situation. Below are some examples of the solutions we have devised to meet the varied needs of our clients as part of our comprehensive service, Wealth Management Solutions. A significant portion of a new client’s net worth was represented by a single stock holding. Such a concentrated position posed a significant risk to the client for two primary reasons: (1) the lack of diversification of their portfolio and (2) any meaningful impairment to the stock’s value could drastically impact the client’s ability to retire when they expected. We proposed five distinct strategies that could be employed to reduce the client’s dependence on the concentrated stock position and, in discussions with the client, we jointly selected the strategy that best met their needs. A client had multiple financial goals, such as funding their retirement and their children’s college education, as well as purchasing a vacation home. They wanted to meet these goals concurrently, though with different priority levels. With our sophisticated retirement planning software, we determined the likelihood that the client could attain each of their goals. We also counseled the client on adjustments they could make to the timing and the cost of their goals so that they could attain all of their financial goals. A client wanted to have exposure to the stock market, but was concerned with incurring a meaningful loss if the stock market corrected, especially as this might impact their retirement plans. We suggested the purchase of a broad market index exchange-traded fund for their core stock position and placed a stop loss order to protect the position. 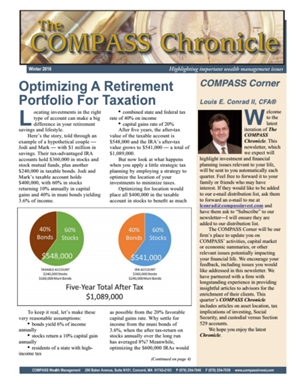 A new client held the majority of their investment assets in taxable accounts. We were immediately concerned with the amount of taxes the client had been paying as a result of these taxable accounts, especially as the client did not need the income that the taxable accounts were generating. We restructured their accounts so that the overall asset allocation/diversification targets, as outlined in the client’s investment policy statement, were met, but relocated their income-producing investments to their retirement accounts where the income would not be taxed. We also placed tax-efficient investments in their taxable accounts to minimize future taxable distributions. We managed the restructuring process so that the client did not pay any net capital gains taxes as a result of these changes.